The Gabarron Foundation’s Queen Sofia Children’s Art Museum is named in honor of Her Royal Highness, Queen Sofia, who is entrusted with the role of Honorary President. 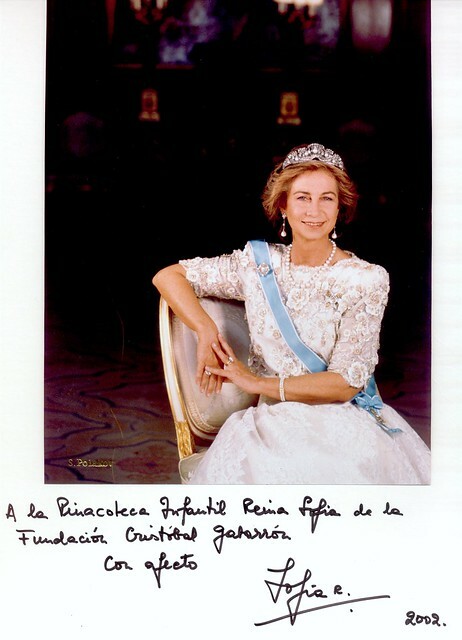 Thanks to the Queen’s interest, the tenacity of Ms. Isabel Carswell de Sánchez-Bella, President of Amade-España, and their collaboration with the Gabarron Foundation in recent years, a special museum has been created to house this collection. The Gabarron Foundation in Spain, "Fundación Cristóbal Gabarrón" (FCG) is a non-profit, cultural organization, founded in 1992. It is recognized by the Ministerial Order of September 22 (B.O.E. 21-10-92), and is entered in the Record of Cultural Foundations of the Protectorate of Foundations of the Spanish Department of Education, Culture and Sport with the number 202, in agreement with the effective legislation. Its principal headquarters are located in Valladolid, the capital of Castilla and León. The Foundation takes its name from the artist Cristóbal Gabarrón residing in Valladolid. Over a decade ago, he and his family, along with several international corporations, created this institution in order to perpetuate the ideals that have remained with him throughout his career: defending, promoting, and disseminating art, science, and knowledge. Since then, the Foundation has worked steadily in favor of education and advancement in a wide range of scientific and artistic disciplines. Thus, the Foundation contributes to building a better future for our society, based on the conviction that an educated society is both freer and more desirable. Queen Sofia Children’s Art Museum is located at the new headquarters of the Fundación Cristóbal Gabarrón, an exceptional and modern building with the latest technology. Of the 5,400 square meters, 4,000 are dedicated to exhibition space: 1,800 square meters of interior space, and 2,200 of outdoor space. The Museum has two small auditoriums: one indoors seating 106, and one outdoors seating 120. The building also houses Valladolid’s new planetarium that has a dome five meters in diameter, and that seats forty. The new space incorporates two modern restoration and fine arts workshops of 360 square meters, as well as a library and fifteen classrooms for the Official Schools of Restoration of Cultural Heritage and Protocol and Institutional Relations. The Foundation's Museum, MFCG, a cultural space for the 21st Century, with a universal vocation to serve society, is the permanent headquarters of collections created over the years of its existence. Currently, its collections have over 7,000 classified works that are authentic fragments of the History of Man; as a whole, they reconstruct a general idea of art and evolution over the centuries.